Q. 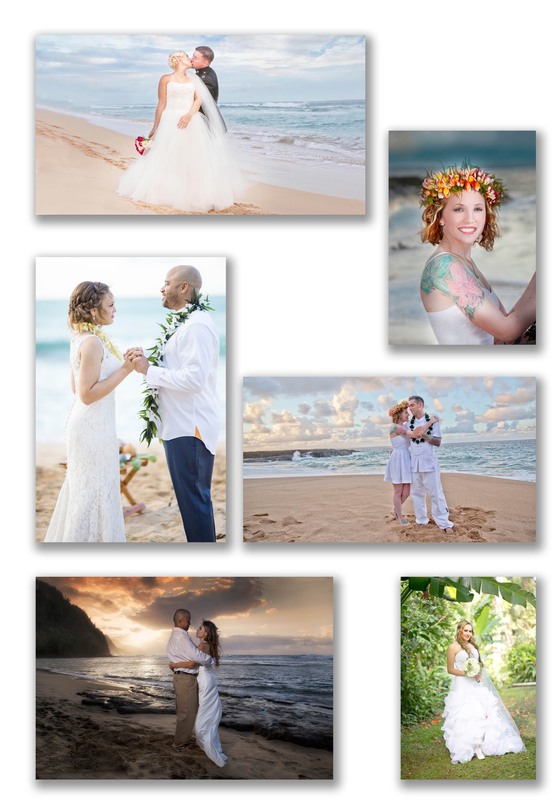 What makes you stand out amongst other Kauai photographers/videographers? A. Style ( I have my own not a borowed one) Work ethic. I’m a bit of a workaholic. Love. Appreciation. The art. Here’s something about my work ethic: For every hour that I spend photographing a wedding, I devote a minimum of 4 hours editing the shots, stretching or reducing backgrounds, removing unwanted objects, opening eyes when necessary, color blending and balancing, making certain that those featured are as perfect as can be—I go the extra mile because I love it. Q. Do you work alone or with a team? A. Up to you. There is an advantage of having a 2nd photographer/ videographer. The 2nd covers b-roll shots—scenics, flower arrangements, landmarks; and he/ she shoots behind-the scenes (another perspective of the video/ photographic session). Last but not least, the 2nd is invaluable with lighting, using support lights that a solo photographer cannot easily manage alone. Q. What do you charge? A. From $350 for a simple photo session, $590 for a simple montage video, into the $4000 range for high end packages. Q. Who own the photos /video that you shoot? A. You! When you choose us you automatically license us the right to use your images for our website and promotions. Q. Can you give me great audio even on a windy beach? A. Absolutely. Shielded lapel microphones. Make sure you choose a package that includes pro audio for great natural sound! Q. If I choose you as my videographer are you okay with me choosing a different photographer? A. Yes, with a caveat. A photographer not used to working alongside us can find herself / himself featured on the video, usually showing his /her backside, which is probably not best for our shot. Additionally, many photographers are unaware or simply don’t care that camera flashes ruin video frames. When we shoot video and photography as a combination we work as a seemless unit giving our clients the best of both mediums. Q. Can I get the camera raw footage? A. Optionally, yes. On an external 1 or 2TB USB drive. Q. Do you offer a same day wedding video edit? A. Yes. 2-3 minute highlights video, as long as there is a gap of 3+ hours between the ceremony and reception. Q. What's your turnaround time? Q. After I receive the video, I know I’ll love it, but if I want changes, will you do them? A. Of course. However, given the time and effort that goes into each project, even small changes can equate to several hours in the edit suite; as such, I do charge a re-edit fee at a reduced rate of $50/hr, and I should be able to tell you how many hours from our conversation about the re-edit. Q. You can stream live? A. We try to stay away from live streaming as it's more of a techinical thing than an artistic thing. But we do offer high-grade, professional live streaming for bigger budget weddings, and corporate events, scripted and fashioned as live shows. Q. Are we the best videographers and photographers on the island? A. We produce top-notch wedding videos, corporate videos, shoot excellent portraiture, landcapes, architecture— as good as any of the top videographers and photographers globally. Q. Can I get drone footage? A. Yes. We offer free drone video archive footage (video that we’ve already shot) versus $350 flat fee for up 2 flights as an add-on to a video or photo package. We only fly in legal flight zones, following FAA rules and regulations, and only when weather conditions are good. Note: Hawaii does not allow drone useage in state parks. Q. Do we charge travel/ time/ expense fees? A. Not for most of the hotel areas such as the north shore, Kapaa, Lihue, Poipu. But we do for mountain areas and the west side, Waimea, Kokee, Barking Sands, etc. $150 per videographer/ photographer. Q. If I want to hire you, what do I do? A. Phone 808-212-9742. Or shoot us an e-mail ... or go to the contact page and fill out the "contact us" form.